Regular travellers on the Hume Highway, heading north from Melbourne towards Sydney will be familiar with the town of Avenel, about one and a half hours into the trip. The landscape there is heavily treed and yet to the right, you are aware of Strathbogie Ranges as they rise steeply, not that far from the road. On the left the country is flatter, and a little further up the road if you look to the left you can glimpse an extensive plain, interspersed with trees that extends many miles north towards Nagambie. Fred Williams made numerous studies and paintings in the area while visiting there in 1975. He stayed with friend and fellow painter Rosemary Ryan (1926-1996) and her filmmaker husband Patrick at their sheep farm Glen Ogil located in the hills above Avenel, not very far from the spot where this view is taken from. Williams chose the spot because of the particular aspect it offered of a flat plain, seen obliquely from an elevated point, and the particular perspective of distance that it allowed. Williams achieved his distinctive view by careful, analytical examination of the site and in particular its optical properties. His vision was remarkably specific and technical, and includes little or no interest in landscape concepts such as the ‘sublime’, grand vistas, rugged mountains or the other scenes traditionally favoured by landscape painters. 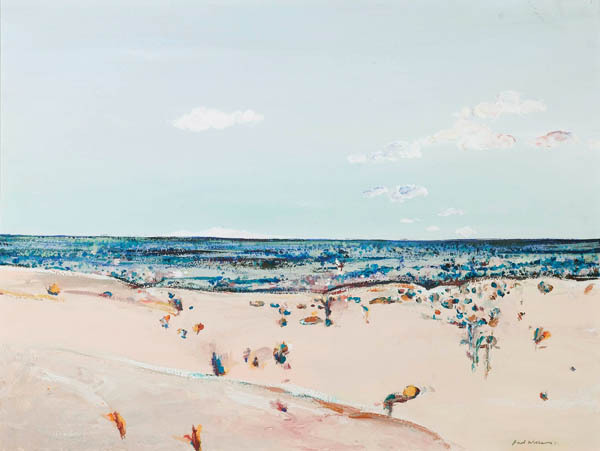 Instead he sought out the type of Australian scene probably regarded as too banal to be of interest to earlier generations of painters and by doing so refreshed his appreciation of it by looking at it as a purely visual phenomenon. His aim was to uncover the characteristics that distinguish it as the Australian bush: the way individual trees blend to create forest, the distinctive way the surface of gum tree leaves catch and refract light, the way forms telescope into the distance and the way the eye behaves when it is drawn to meet the horizon. The Avenel series illustrate Williams’ technique perfectly. Immense distance is flattened to a fine band, and foreground and sky define its foreshortening, emphasising the horizon as the point where landscape elements converge. A generation after he painted his Avenel series it requires a little effort to remember the 1970s Australian art world and to recall the effect Williams’ work had on his audience at the time. He became a household name, famous because the landscape paintings he produced had the ability to effect a change in the way Australians perceived the country in which we live. For many, he was the first artist to recognise that what made the physical geography of Australia different from other places was worthy of appreciation in its own right. His vision and his life’s work were directed to understanding the reasons for this, and as a consequence he became an integral element of the self-awareness that strongly flavoured Australian cultural life at the time.